The following is a preview of a full-production copy of Carrotia, launching on Kickstarter from MAGE Company on August 25th. Real time games can be tricky. 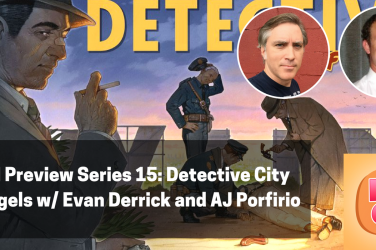 They require a careful balance of tension and simple mechanics that players can pick up and implement fast enough that the ticking timer doesn’t cause major mistakes. So, in approaching Carottia, I was a bit apprehensive. 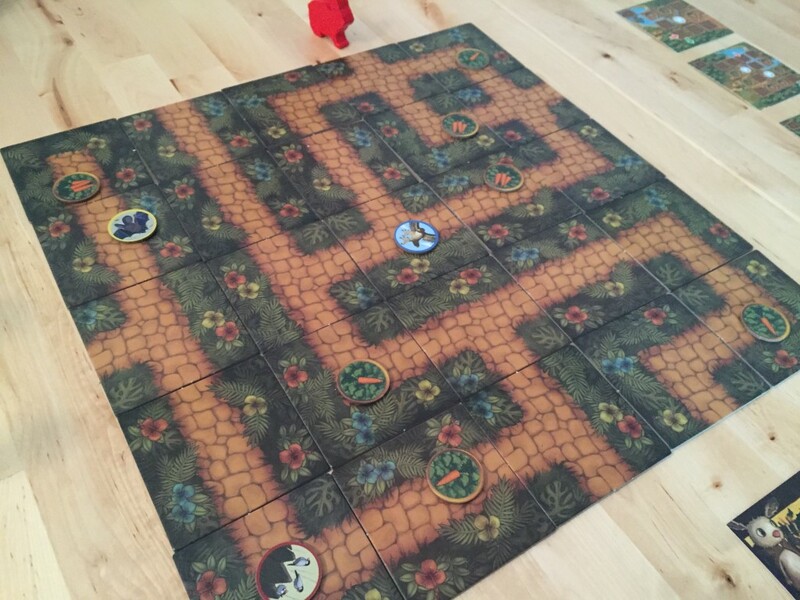 The game relies heavily on three hour-glass timers over the course of three rounds during which players must put down tiles to form a path through the woods, while avoiding birds that may swoop in and move the player’s character, steal carrots, or just mess with the board space. It’s an interesting combination of mechanics because it forces players to think quickly and plan effectively while trying to map the quest cards that are played each round. Misplayed cards cause deductions and the game gets harder the slower you go, not unlike other real time games of this nature. In Carrotia you are, you guessed, it a rabbit. Or one of several different rabbits to be more precise – each with a special power. Your goal in the game is to traverse the forest and pick up carrots on your way to the other side. 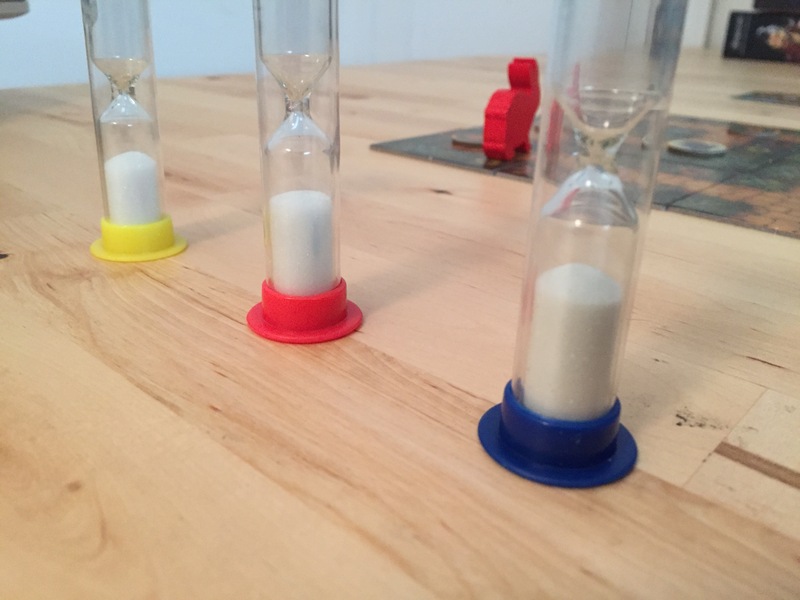 The game is played over three rounds, during which you will be placing tiles against a sand timer. The first round has you create a 3×3 grid in 30 seconds. In round two, you grow that to a 4×4 grid in 60 seconds, and in the third round it becomes a 5×5 grid with 90 seconds. As you build, you will attempt to match your grid to a quest card that shows the entrance and exit points on the map. Your rabbit must then be able to get from the entrance to the exit during a special non-timed phase, while picking up carrot tokens that are on the board. The game is cooperative and pits the characters against both time and birds that can muck up your efforts as you progress. Some bird tokens will appear on the board by default based on the quest card. 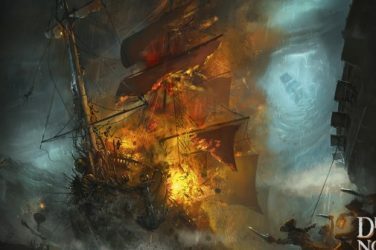 Others will come out based on specific effects that might trigger during the game. There are dice that then tell you what direction the bird will go on the board. The goal of the birds, which are operated by these dice, is to move the rabbits, steal the carrots, and generally cause chaos as you travel. Each bird type has a special ability as well, some of which are good for you, many of which are bad. In addition to special abilities form birds, your rabbit has its own special ability. These thematic rabbits add a bit of fun to the game and ensure you play yours different than anyone else. 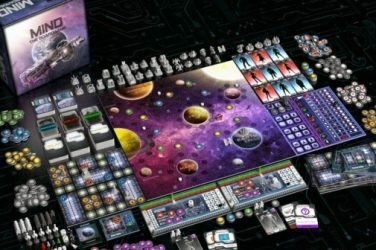 The game is quick, and the first few times you play, not unlike Galaxy Trucker, you’re just guessing what you want to do and when. Without a sense of how many tiles are in the deck or how often the ones you need might come out, it’s hard to know where to place your more flexible tiles and when to bite the bullet and put something down in an illegal placement. These illegal placements can cost you, with extra movement of maze tiles after completion costing additional bird tokens. The nice part of it all, is that the game takes only about 20 minutes to play. And because the goals are the same regardless of player count, it is consistent from one player all the way up to the full complement of six. 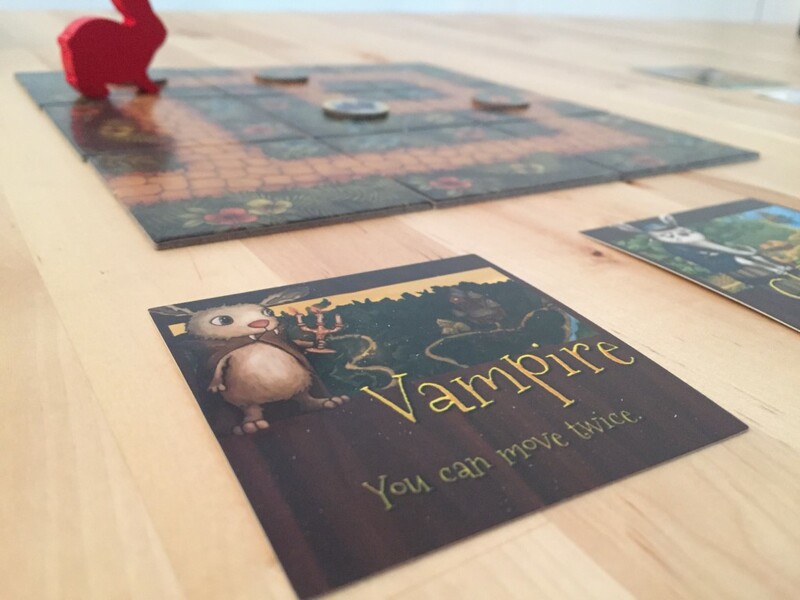 We had a couple of games where poor placement made it essentially impossible to win the game after the first round, but once we warmed up and got a feel for the game, it became increasingly possible to do what we were trying to do. Carrotia is a simple enough game, with the added stress of a real time component. This makes it a good fit for small children, even if you just extend the timer a bit and give them more time than the rulebook indicates. 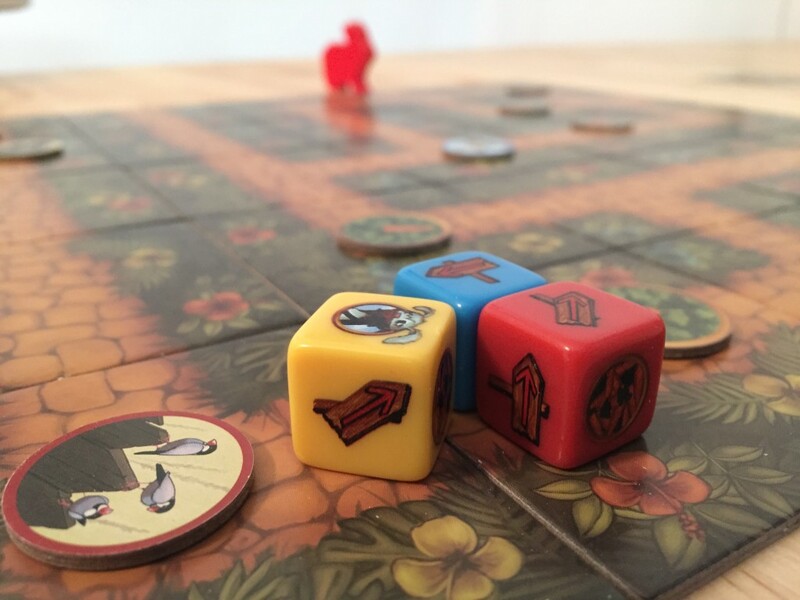 The birds can be nasty, but they are mitigated to some degree by the size of the board and the fact that the dice only have them moving one space at a time. And the character cards do a nice job of giving the players a bit of an extra edge, while making each one feel unique. 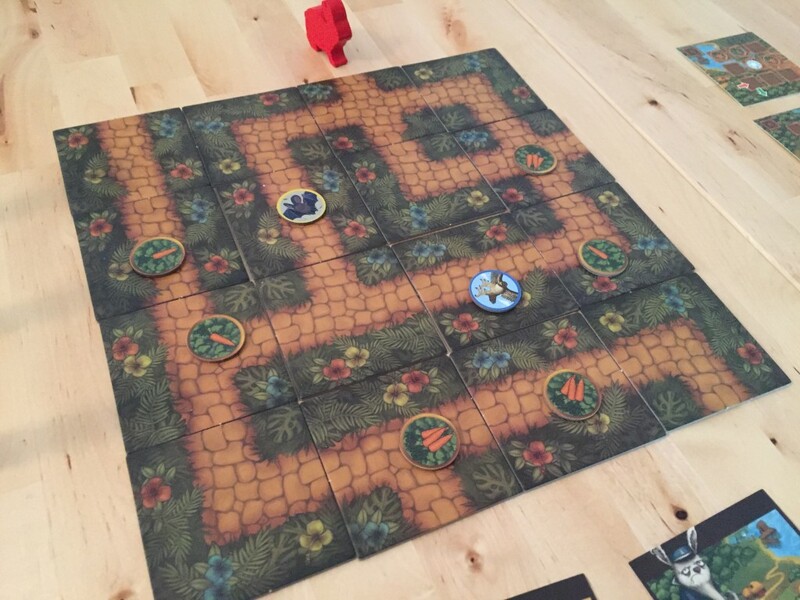 As such, Carrotia is a fun little game that takes only a few minutes and is accessible for small children as well as adults. 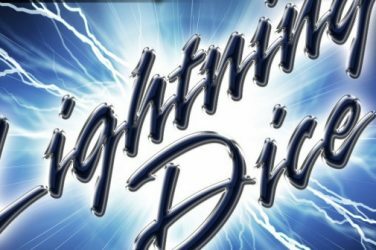 I don’t see this game hitting the table for my regular game nights very often, but based on initial impressions, I can definitely see it being something my children are eager to play with the family after school. 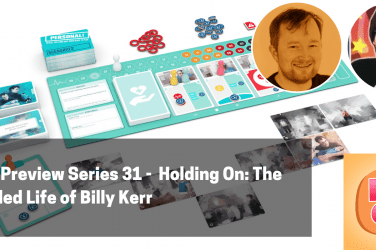 The game works well and the result is fairly consistent for a co-op, ensuring you win about as often as you lose (which is a good result for a family-oriented game), but the elements that impact your character can be a bit too random in some cases. As I mentioned, the draw of the tiles resulted in our almost immediate loss the first couple of plays, and the birds, while mitigated by range, can be problematic if they move you out of the way of your objective early on. 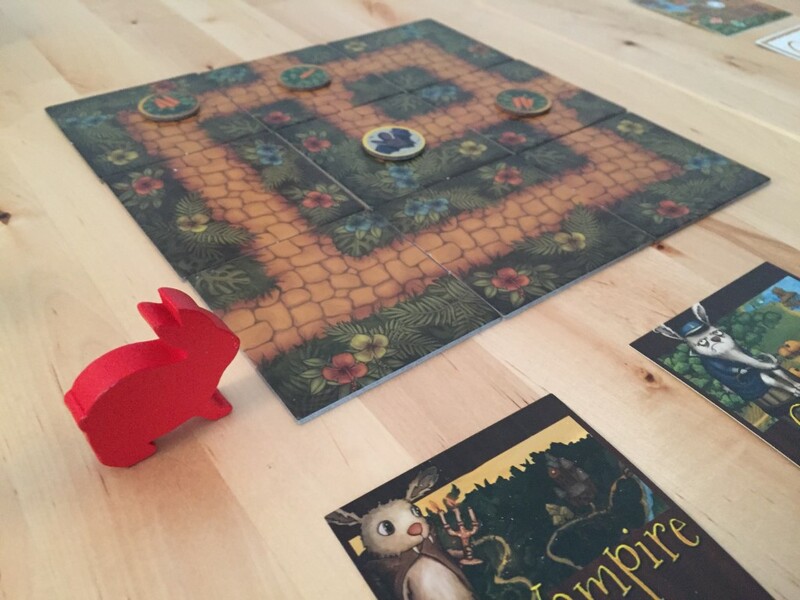 That said, the game is quick, easy to teach, and cute enough with the different asymmetrical powers these rabbits yield. 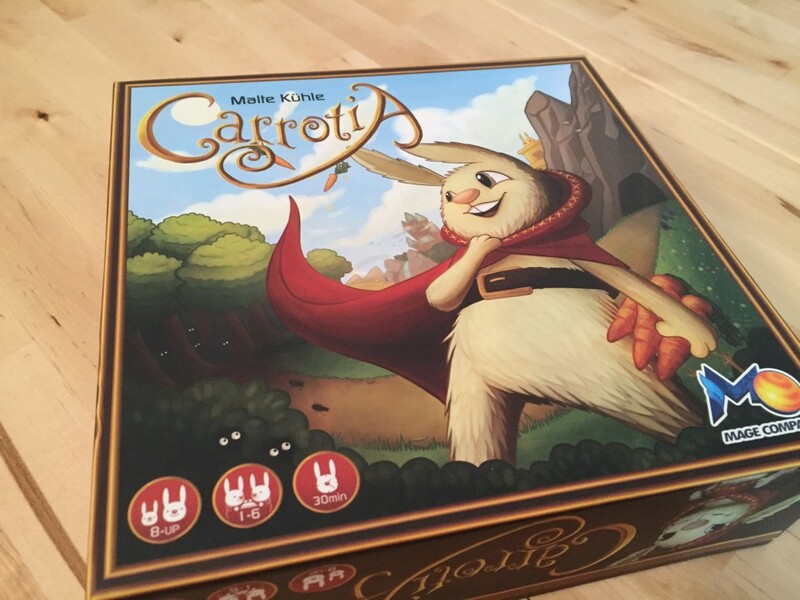 If you’re looking for a short, accessible co-op with real time elements for your family, give Carrotia a play.